This delicious mix of meringue, fresh seasonal fruit and whipped cream is simple to prepare and is always a hit at dinner parties. 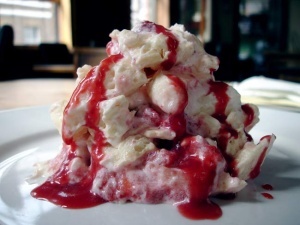 It's basically a smashed-up pavlova! Break the meringues into small pieces and set aside. Wash the fruit. If using raspberries, simply toss them in the sugar for a couple of turns and set aside. If using strawberries, either half or quarter them, depending on their size. Toss the strawberries in the sugar to macerate them. Treated in this way, the sugar will help to draw some of the juice from the fruit, and add some sweetness to the dish. Whip the cream until fairly stiff; too loose and it spoils the finished texture of the dish. Just before serving, add all the ingredients to a large bowl and fold together gently. You have an excellent excuse to finish it all off, because this dish spoils quickly once it has been combined.